Inder Loves Folk Art: Sock-ta-pus. My sock monkey still needs a tail, arms, and face (right now, it looks more like a sock ghost than a sock primate - downright creepy), but Elizabeth made this gorgeous thigh-high-purple-stockings-sock-ta-pus in just one day! I'm so impressed and inspired! 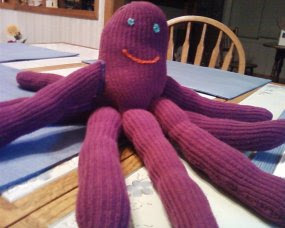 Her little niece Alana is a lucky girl - so many tentacles to snuggle! I think you should leave it as a sock ghost and market it as the world's easiest craft project! It'd make more money than the pet rock. PS My word verification today is great: iwfnosve I think it's the Norwegian name of your ghost-sock creation. First dress in a decade. Still on the hunt for the perfect mu'u mu'u. They TOOK my six-word memoir! Inder's Top 5 Concept Albums. A Saga of Swiss Chard. Because you can never have too many pit bulls! Jonny Justice takes on FOX.